Product information "Digital CDI for Honda Dominator NX500 (PD08), NX650 (RD02/RD08), XR650L (RD06)"
Note: The CDI is available as a programmable version that can be used in all motorcycles where either a CDI system already exists or in which such a system can be installed. Our CDIs are produced in Germany and have evolved into a true success story over the years. Our ignition boxes are DC-CDIs and a complete redevelopment of the original CDIs, where many analogue and meanwhile ancient parts were replaced by modern and more robust components. programmable The connector is positioned further away from the edge and is better protected against pressure from the seat bench. Ignition is possible for voltages down to 6 volts (e.g. battery aging, cold weather, or long idle times). Our digital ignition boxes are DC-CDIs with modern components that have not been available yet when the original CDIs were designed. A sophisticated protection circuit using a special IC protects our CDIs against overvoltages. Thyristors connecting the ignition capacitor with the ignition coil to trigger the ignition were replaced with a modern IGBT. The bipolar transistor of the voltage converter was replaced with an FET with significantly lower switching losses. The ignition map of the original CDIs is conservatively designed for normal gasoline (91 RON) or worse. Our CDIs allow you to choose between the original map and another one optimized for super petrol (95 RON). With this configuration, torque, power and efficiency of the engine increase noticeably. The charging voltage of the ignition capacitor remains constant even when the engine reaches maximum speed. In the original CDIs,s a significant voltage drop can occur since the time frame for recharging the capacitor between ignitions decreases. Our built-in voltage converter is highly efficient. If the battery voltage falls below a critical threshold (e.g. due to cold temperatures, wear and tear, or long idle times), our CDIs compensate the low voltage with a moderate reduction of the ignition voltage instead of a rigorous increase in the resulting current. Our CDIs feature an integrated protection circuit using a special IC. 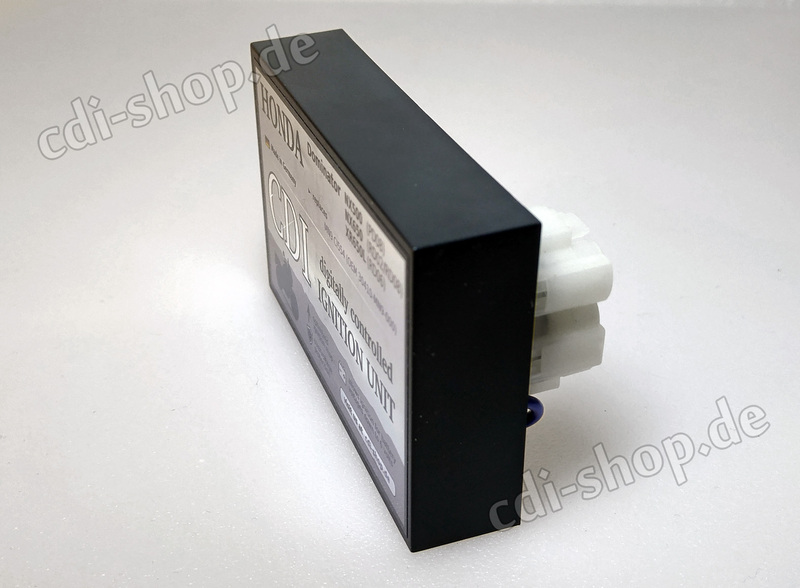 While the analogue CDIs can be critically damaged by faulty voltage controllers, our CDIs are protected against overvoltages, voltage reversals, and other risks (such as loose connector contacts). All our ignition boxes are equipped with an indicator light (LED) which lights up for 1 ms with every ignition. From about 2000 RPM upwards, the human eye perceives this as permanent light. When the LED lights up, it is ensured that the CDI is powered by the on-board power supply (fuses, ignition switches, kill switches, plugs etc. are therefore OK) and that the pulse generators function. An error in the ignition system can then be excluded with a high degree of certainty. One obvious conclusion would then be that the fault is in the gas/air mixture (test with start pilot recommended). Our CDIs are available in two versions. Please select the version you want to order from the drop-down list above. This is the "plug & play" version of our CDI - just install and go. In addition to the standard ignition map for 91 RON, the CDI comes with an advanced ignition map optimized for 102 RON, which has so far been tested with the NX650. If desired, you can switch between the preset standard ignition map and the advanced ignition map by repositioning the jumper (see picture). Note: In the long term, a dual-line CDI with advanced ignition map for 95 RON is planned for the Dominator as well. Unfortunately, we do not have one at the moment. With a little help from passionate Dominator drivers, we hope to be able to include such an ignition map in our portfolio soon. 1) The standard ignition map corresponds to the original and is conservatively designed for the octane number of regular gasoline (91 RON). It makes sense to use this configuration if you are travelling abroad and use gasoline with a low octane rating. 2) The advanced ignition map is the recommended setting and is optimized for today's octane rating of Super Petrol (102 RON). In the medium speed range, the ignition is triggered earlier, which gives the twins noticeably more power. For technically experienced users, we also offer the CDI as a programmable version. This version can be configured from the computer or laptop via the USB interface within predefined limits. Our software allows adjusting the ignition map, ignition voltage, pulse generator switching edge, sensor type and its parameters as well as the side stand monitoring. 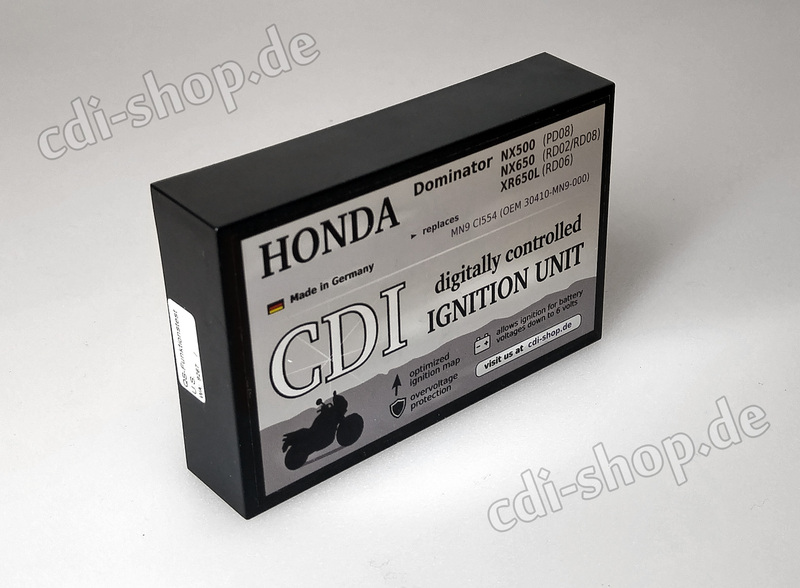 The CDI can in principle be used in all motorcycles where either a CDI system already exists or in which such a system can be installed. In order to program the CDI, it is connected to a computer with Windows operating system via a converter and USB cable. To do this, plug the converter into the six pins of the CDI and connect it to a USB port of the computer via the connection cable. 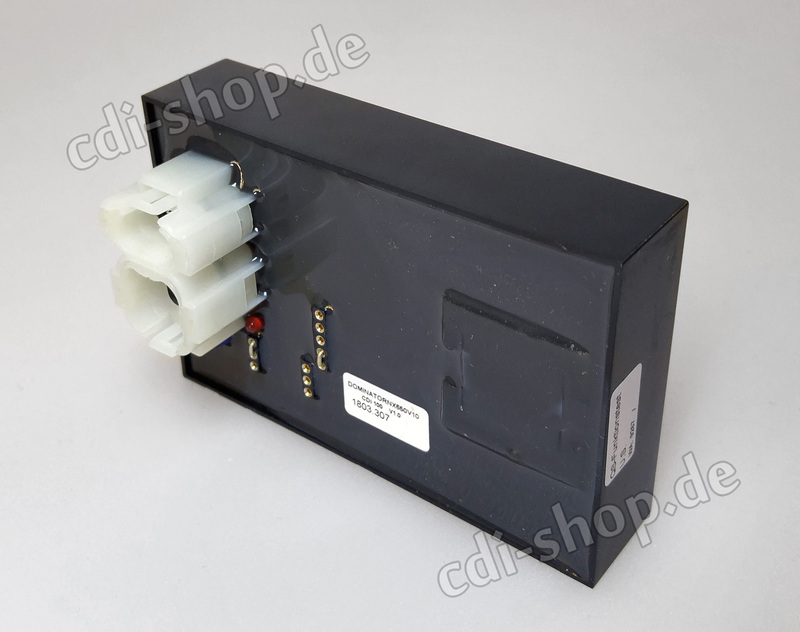 We offer converters and cables separately in our shop, since only one set of accessories is needed for programming several CDIs. The CDI is programmed with our software CDI Tuner. The software is freely available for download together with the required drivers and can be accessed without purchasing a CDI. There are predefined profiles for all supported motorcycles, which can be modified as desired. Links and further information can be found here. Please check the legal situation regarding modifications. We do not assume any liability for damage or violations of the law. 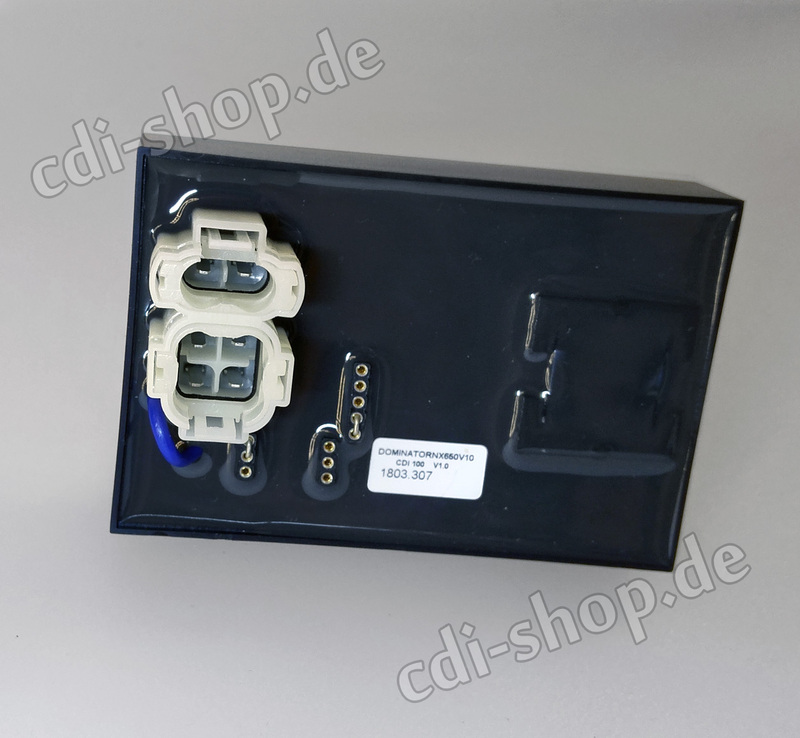 The CDI has a blue wire jumper (see picture on the left). This wire exists because models without side stand monitoring have a slightly different pin assignment. The jumper must remain intact for these models. For other models, the jumper must be cut (e.g. with a side cutter) to activate monitoring. Just like with the original CDIs, spark plugs with an integrated resistor must be used, recognizable by an R in the designation (e. g. NGK DPR8EA-9). And last but not least: We are always happy to help you with any questions you may have. Do not hesitate to contact us. 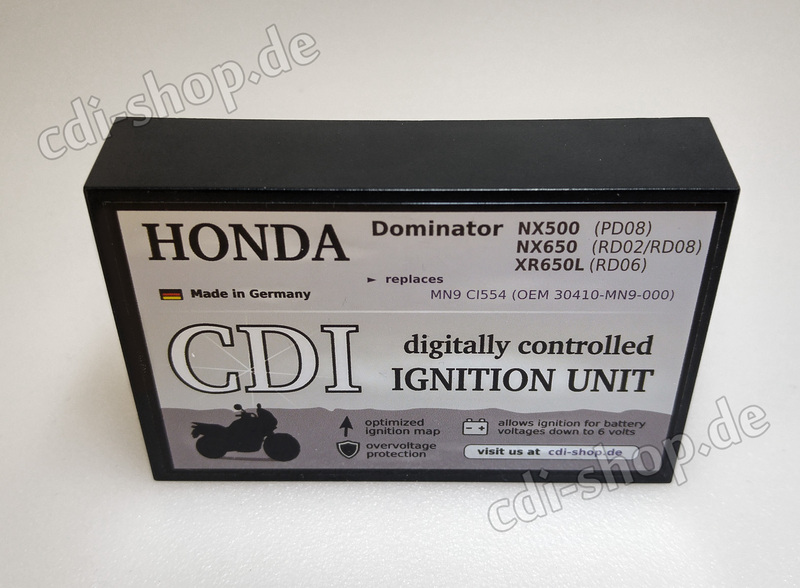 Related links to "Digital CDI for Honda Dominator NX500 (PD08), NX650 (RD02/RD08), XR650L (RD06)"